Ginger garlic paste: 2 tsp. Red food colouring [optional] : 1/2 tsp. 1.Cut the cauliflower into small florets and soak them in salted warm water for 10 mins. 2.Wash them twice in running water and drain well. 3.Meanwhile mix all the ingredients from ginger garlic paste to red food colouring [if using]. 4.Mix this paste with the gobi florets well so that all the florets are coated well with the masala paste. 5.Marinate the florets for atleast a couple of hours [the more you marinate the more deep is the flavour]. 6.Heat oil in a kadai and fry the florets in small batches until crispy and done. 7.Serve hot garnished with lemon wedges, onion slices and fresh coriander leaves. Entry for the event "Winter Warmers" by Jyoti . 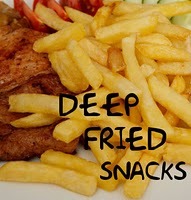 Entry for the event "Deep fried snacks" by Radhika. Entry for the event "Winter comfort food" by Tamanna. Do check out my blogging buddies : Priya Suresh , Srivalli , Ayeesha , Veena , Monika , PJ Azeema , Priya Vaasu , Jay , Soumya . Looks so crispy-crunchy n delicious! wow...gobi 65 looks amazing.. can feel the taste through ur awesome clicks...soo perfectly done...drooling here...yum yum yum yum! Cant take my eyes from the click,soooo tempting crispy beauties.. Very yummy fries and awesome clicks.. This is indeed a lip smacking snack and very simple. yummm...Tickling my cold bones into making this soon,thanks. I've always only had Chicken 65....This is a great change! I like the fact that gobi did not look oily at all. Great recipe & amazing pic. I should try some day! !